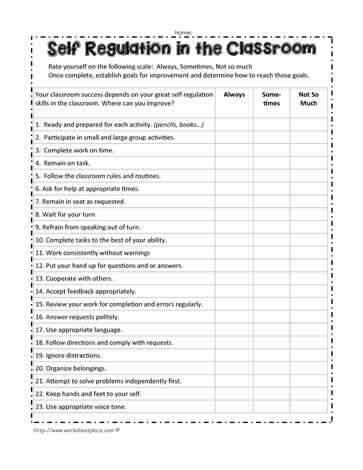 Your classroom success depends on your great self regulation skills in the classroom. Where can you improve? 2. Participate in small and large group activities. 3. Complete work on time. 5. Follow the classroom rules and routines. 6. Ask for help at appropriate times. 7. Remain in seat as requested. 8. Wait for your turn. 9. Refrain from speaking out of turn. 10. Complete tasks to the best of your ability. 12. Put your hand up for questions and or answers. 15. Review your work for completion and errors regularly. 18. Follow directions and comply with requests. 21. Attempt to solve problems independently first. 22. Keep hands and feet to your self. 23. Use appropriate voice tone.